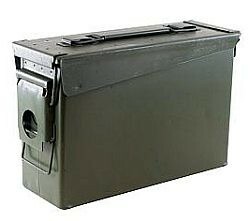 These New .30 cal Ammo cans are the same cans that are being used by U.S. and NATO forces around the globe. They have hundreds of uses around the home, shop or range. The sturdy steel construction and waterproof seals ensure that these cans will keep the contents safe and dry for many years.